Compass Records announce that the next album by the Special Consensus (USA) will be a tribute to the late John Denver, in which the band will be joined by friends from the top ranks of bluegrass music. Country boy: a bluegrass tribute to John Denver is scheduled for release on 25 March 2014, and is produced by Compass Records co-founder Alison Brown, who plays banjo on one track along with Special C. leader Greg Cahill. Other guest artists include Dale Ann Bradley, Jason Carter, Mike Cleveland, John Cowan, Rob Ickes, Jim Lauderdale, Claire Lynch, Peter Rowan, Buddy Spicher, and Rhonda Vincent. More details are in an article by John Lawless on Bluegrass Today, including Greg Cahill's account of how the project was conceived, and a video of one of the numbers in performance. Special Consensus, who regularly and frequently tour in Europe (most recently in November 2013), maintain a busy year-round touring schedule, reaching an eclectic demographic through appearances at festivals, listening rooms, bluegrass-in-the-schools programmes, and symphony appearances. Their 2012 release Scratch Gravel Road achieved a Grammy-nomination for Best Bluegrass Album. 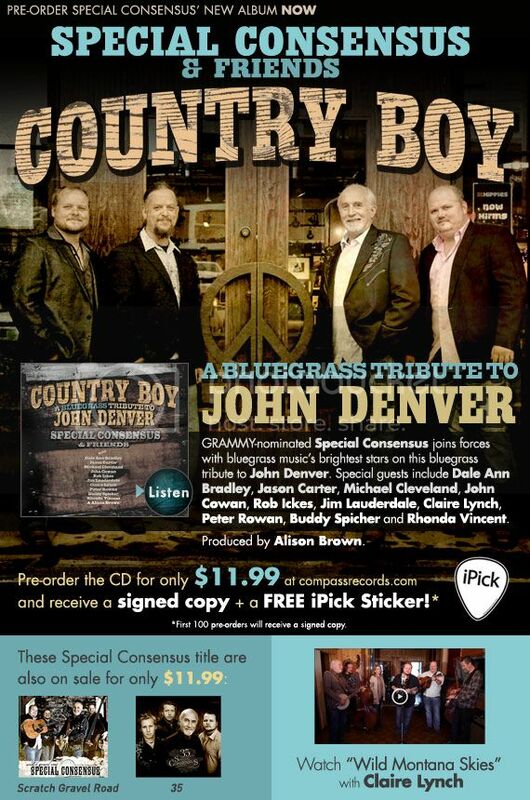 Country boy: a bluegrass tribute to John Denver can be pre-ordered from Compass; the first 100 pre-orders will receive a signed copy.